with additional assistance from the Members of the CEF Study Group. Highest Rank Attained, Initial, Last Name & Unit first attached to upon arrival in France. This information can be found on the reverse of the 1914-15 Star and on the rim of the British War & Victory Medals. This is similar to the British custom regarding First World War Medals. 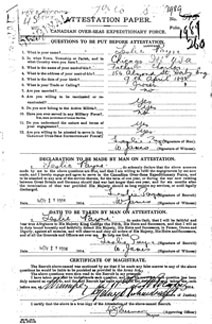 This series consists of approximately 620,000 individual Attestation papers and Military Service Act Enlistment forms. They were completed in triplicate at the time of enrolment in the CEF. At least one copy of the Attestation papers or Enlistment form accompanied the CEF member overseas, where it was placed on the individual personnel file at the Ministry of the Overseas Military Forces of Canada in London. 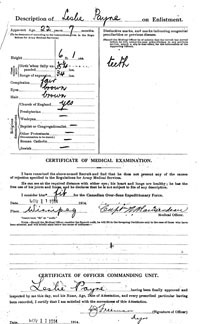 Paper originals of the Attestation papers and Enlistment forms are described by the National Archives of Canada as RG 9, II B8, Vols. 1-1256. 260 Battalions were raised only 52 Battalions served on the Frontline. o What units served with overseas. • The Canadian Virtual War Memorial. o Searchable by Name and Year of Death only. o Will provide unit, service number, date of death and allow you to digitally view their name in the Book of Remembrance as well as provide burial or commemorative information. • The Commonwealth War Graves Commission. o Searchable by Name, nationality, branch of service and date of death. Also provides burial/commemorative information and some next of kin information. o Most Unit War Diaries are available online. o Since it is a digital scan, it is difficult to search but there is currently a project under way to transcribe the war diaries into searchable Word format by members of the CEF Study Group. 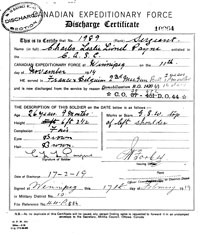 o Once you receive the soldier's service records you can track their service overseas tracing where they were S.O.S "Struck Off Strength" or left a unit and where they were T.O.S. "Taken on Strength" or assigned to another unit. o Cross referencing the soldier’s service history with the dates in the War Diaries can give you a clearer outline of his service. o The war diaries can be searched by unit and cover a specific block of time. By referencing the war diaries you can trace a soldier's service from rest billets to front line trenches. Unfortunately the diaries rarely mention anyone individually, except officers. The diaries normally list gallantry award recipients. o A great PDF file for download: Nicholson's Official History of Canada in the Great War is available as a PDF file. o The CEF Study Group. An online forum where students of the Canadian Expeditionary Force can exchange information, research tips, reference book checks etc. With hundreds of members and thousands of posts, the forum has become a hub for serious students of the Canadian Expeditionary Force. All images courtesy Neil Burns and Brett Payne.